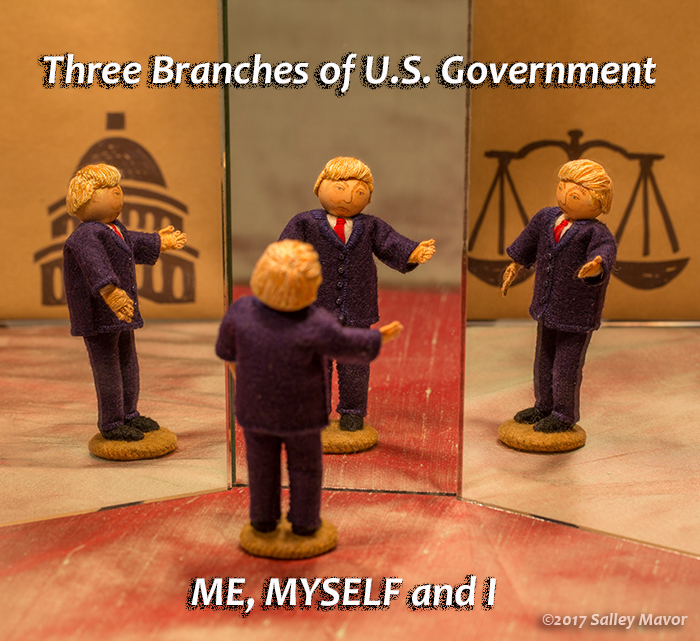 The Constitution of the United States divides the federal government into three branches (Legislative, Executive, Judicial), to ensure a central government in which no individual or group gains too much control. 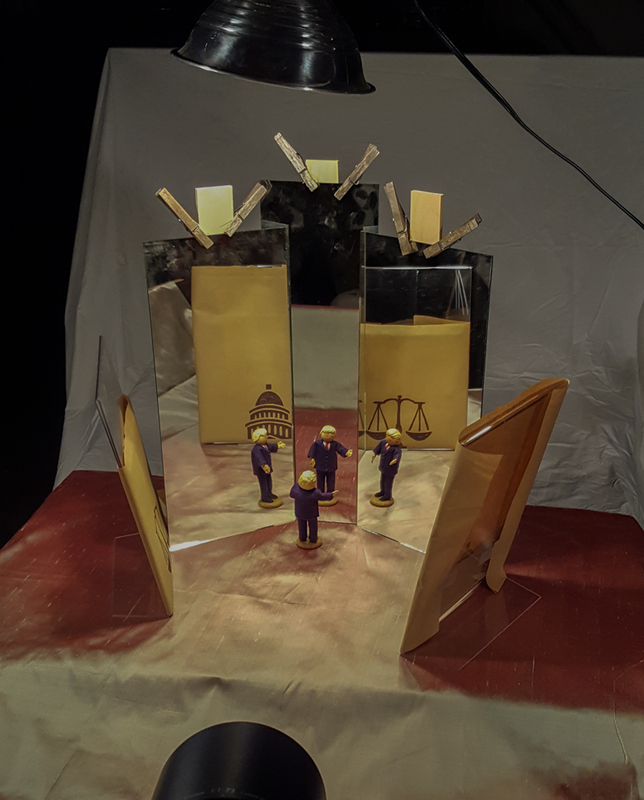 Behind the scenes at Wee Folk Players: Mirrors (but no smoke this time) were arranged to create a three way reflection on the minimalist set. Being a one man show, the scene didn’t require extra cast members. And resident tech wizard Rob, promptly processed the documenting photo. The drama troupe is busy trying to keep up with script changes and a grueling rehearsal schedule. New cast members are being auditioned and needles are flying in the costume department. Stay tuned for more episodes in the American Drama Series! The Wee Folk Players (They’re a Stitch) formed soon after the 2016 election and have performed a string of episodes in the American Drama Series. To keep up with new posts, subscribe to this blog (top right column on the home page). For a wide ranging look at new and old material from my studio, please follow along on Instagram and Facebook. And to find out about Salley Mavor’s post-election satire, please this interview. Excellent! Sadly true. But I believe he’s about to get a comeuppance from San Francisco!! Brilliant!. Thank you for sharing your creative responses to what’s going on in our country. I don’t know that it makes me feel better (stuff is pretty scary), but it does make me feel hopeful. May we all be able to process the challenging and frightening into art. I really do love you. Please don’t let Polly go into politics. My political views have been wedged between plants on my blog, too. We are Americans as well as artists. Don’t worry about Polly – she’s pretty oblivious to reality. With you Salley. I’ve found my art changing as well with this new or different blatant in your face women bashing so called president. I guess I’m from the era where you had a voice but were also polite. Oh, maybe that was my world of Faeries, Gnomes, and Elves. Anyway, enjoying your/our new venture. Again right on needle point! I burst out laughing at your “me, myself and I”. You’re a genius! This is great, Salley — nice work with the mirrors! Keep it coming! Thanks for following along Carla. I’ve noticed the same thing on my phone and believe the home page right column only appears on a desktop commputer. 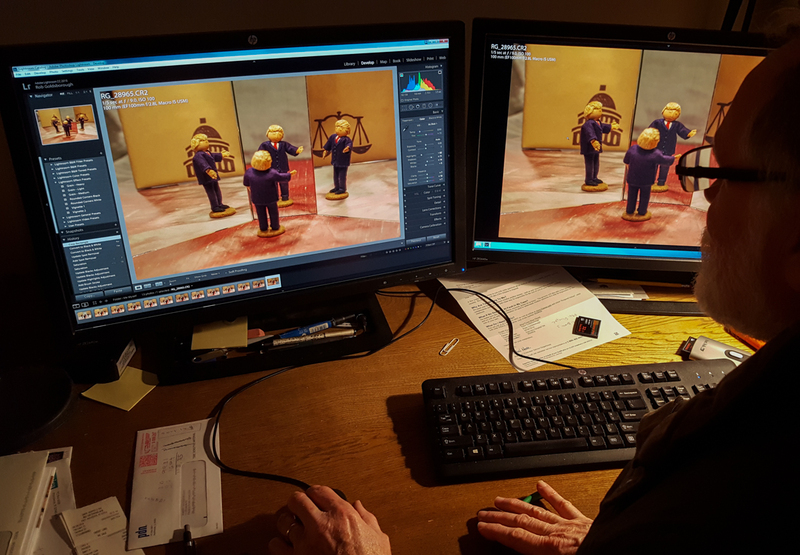 I LOVE seeing behind the scenes! And I am so inspired by you. Thank you for all you do. You do it so well. Could not have demonstrated it better! Love it! Keep up the goodwork, these make me smile in an otherwise grim political season. And thank you. You are becoming quite the political cartoonist, and you ALWAYS hit the nail squarely on the head! You make me laugh and think at the same time (hard to do at my age); but you NEVER cease to entertain me. Thank you. I am constantly amazed at the depth of your satirical wit. Keep on keeping on!! Awesome! Love it – to the point as always! The pity party continues, snowflake!! Love it! What a talented group of people. You give me a good laugh with my morning coffee. Have you sent your blog posts to Saturday Night Live? If not you should. Delightful commentary on our new reality. This is great! Can’t wait to share this. All he needs is his surrounding crowd of sycophants to give him his standing ovation. I really enjoy your perspective.